PICTURE THIS: A FABULOUS CONVENTION! I'm back from our annual CTMH convention and have lots of news to share! We have a new Idea book that will cover Autumn and Winter. We're going from 3 per year to only 2, which is great - more pages per book! 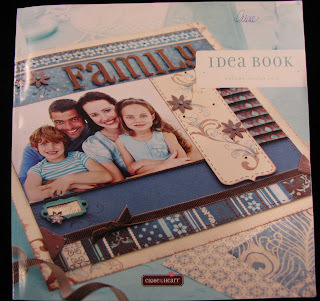 There are new colours and new paper packs, new stamps, and -- my favourite 'new' thing - a NEW LAYOUT BOOK called MAGIC! Magic shows a ton of new techniques and options for pages with more photos per layout. Also new: changes to our post-bound albums. The new My Legacy Faux Leather Albums are easier to keep clean and the price has dropped to $29.50 each! That's a price drop of $17.45!! There are five great colours plus black. The convention was in Washington DC. I've never been very interested in US politics or history but wow, was there ever lots to see and learn about this amazing place. We even saw the PRESIDENTIAL MOTORCADE leaving the White House... a tour guide said that you can tell if it's carrying the President because he always travels with an ambulance... yup, it had an ambulance - lights flashing and all. Very exciting!! Thanks fellow consultants, for a fabulous event.